Home / Blog / Happiness is Spontaneous Abundance! 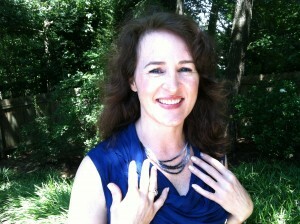 The Sapphire Necklace a Local Jeweler Loaned Me! After another incredible Romance Writers of America conference, I have to say that I get super duper happy when spontaneous abundance shows up in my life. It’s all those incredible moments and gifts when you aren’t looking and something special shows up. Here are my highlights from RWA in no particular order, and my deepest thanks to the people (mostly writers) who showed up and made it happen. –The woman I dubbed our own Anne Hathaway of RWA, Kristan Higgins–funny, big-hearted, and elegant–for introducing me to her super cute hubby McIrish as her friend. Deeply touched. –For Bella Andre inviting me over to join her circle at the Barnes and Nobles bash even though we’d never met, for telling me she loved my covers (squeal! ), and offering some great advice about how to get NORA ROBERTS LAND to the top of the lists. She is generous beyond words and is one of the most positive people I have come across in a while. You rock! –For Jayne Ann Krentz, whom I stood next to in the longest hotel check-in line ever, and making the most of it by chatting and for her telling me she liked NORA ROBERTS LAND’s premise and thought it would sell really well. Awesome! –For meeting Nora Roberts daughter-in-law at Nora’s annual party, a truly lovely woman who actually thanked me for my past work overseas rebuilding schools and clinics in places like Congo. Made my heart melt. –For a hug from Nora at her awesome party and always including me in the festivities. –For my WRW pals and their raucous laughter and innuendo later in the evening when we can kick off our heels and simply let our hair down. You know who you are. –For Jana Oliver, who told me “Be patient, little grasshopper,” and then invited me to the Georgia Romance Writer’s Party, THE BEST PARTY EVER. I mean they bring their own DJ. It was awesome to dance with y’all. –For Christie Craig, whom I approached at the St. Martin’s Party to share how much I enjoyed her workshop a few years ago, and for being so lovely and supportive. –For new encounters with Katy Regnery, whom I met on Twitter (I still can’t believe I am saying that), and for meeting Sara Fawkes and hanging out and talking about Indie publishing. –For Laura Reeth and Mary Blayney, who continue to be bright lights in my life! –And lastly, for my mom, dad, and Fashionista sister coming to the Literary Signing to see what this new world that I am a part of is all about and to support me. You guys are the best! Open yourself to your own spontaneous abundance. Don’t know how. Just ask. It always shows up. Here’s to tons more!